If compressor is shut off for any reason PERMANENT DAMAGE can occur to compressor from water backing down the air line and into the compressor. Galvanized plumbing will rust inside & cause excessive nozzle wear. Pressure washer extension hose with 22mm swivel connectors on both ends. This design utilizes internal mixing. The top 2 nozzles on the SAH-SG2 Combo™ Snowmaker are high pressure water. The bottom nozzle is a “combination” of high pressure water and air, this nozzle is your nucleation nozzle. For more information on how man made snow is made check out our snowmaking science page. To make building this design easier SNOWatHOME has put together an Internal Design Nozzle Kit. This kit was put together using our custom designed snowmaking nozzles. The package includes parts #1, #7 and #10 from the parts list. For more information on the importance of nozzle choice click here. You can purchase the remainder of plumbing parts listed above at most hardware or home improvement stores. Assemble the parts exactly as they are shown in the photo. All connections must have Teflon tape pipe sealer before final assembly. Attach your SAH-SG2 Combo™ Snowmaker to something secure like a ladder or fence post. You can do this with large wire ties or metal hose clamps. Connect the pressure washer hose to the 22mm pressure washer adapter on the snowmaker (At part #7) and to your pressure washer. Connect a garden hose from your pressure washer to your water spigot. Make sure the ball valve (part #8) on your snowmaker is closed and turn on the water. You should now have high pressure water coming out of the top two SAH™ Upper Misting Nozzles and air coming out of SAH™ Air Nozzle. 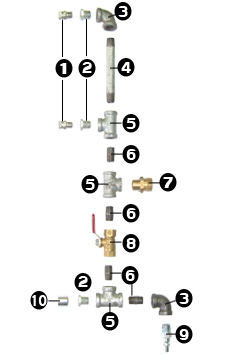 Open the ball valve slowly until you see a small amount of water enter the air stream. 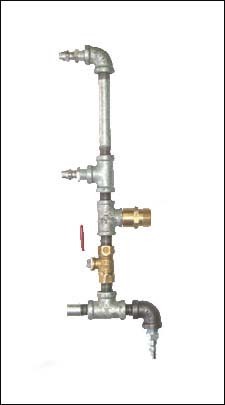 It is typical for you to get a pulsing flow, adjust the ball valve to get as steady of a stream as possible. Remember the valve should be opened a very small amount. You want mostly air coming out of the bottom nozzle. If the weather conditions are right for snowmaking you should now be making snow! Due to the nature of the free plans provided we do not offer technical advice on construction or operation on any of the free snowmaker plans. All free plans are for personal, non-commercial use, copywrighted plans are not to be used to sell a product or service. You may not copy, distribute, reproduce, modify, transmit, publish, upload, reuse, re-post, or otherwise display the Content for public or commercial purposes.